The option to insert web located pictures into a signature has been restored for OWA, Office 365 and Google Apps policies. Shortcuts to Administration Panel and Client Apps now include the program’s name. The error message text in case the server connection cannot be established has been clarified. Changes in OWA policy settings (e.g. Automatically append a signature to outgoing messages) are now immediately updated to users’ accounts. 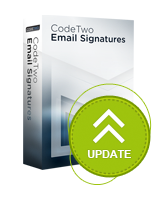 For more information about CodeTwo Email Signatures version history visit this page. The update is free for all CodeTwo Email Signatures license owners. We recommend that users update their installations of the program, by downloading the latest edition and installing it on top of their current edition. Keep in mind that, after the update, client MSI packages will have to be generated and deployed anew. If you have any questions, make sure to contact us. We are open 24 hours, 5 days a week.